COLUMBIANA- Margaret Louise (Hoover) Lamoncha of Columbiana, OH, graduated to heaven January 20, 2019. Margaret was born on June 26, 1924 to Chalmer and Ida Hoover in Hollidaysburg, Pennsylvania. Margaret had a brother Chalmer (Totsy) Hoover and sister Gladys (Sam) Tussey. She graduated from Hollidaysburg High School and attended Comptometer school acquiring the skills to become secretary at the Hoffman Dairy, then secretary at Hollidaysburg High school, secretary at the McClanahan Company and lastly secretary at Humtown Pattern. Margaret’s best friend was Jesus, He taught her to be a giving mother, grandmother, and great-grandmother. Her life was “Giving” to God, Family, and others. Margaret worshipped at First Christian Church, where she was a Sunday school teacher, church choir member and director, was in the Columbiana Music Study Club, was an Eastern Star, and a “grey lady” volunteer at Salem City Hospital, a mentor at the Crestview Elementary School for 19 years, and recently attended worship with Greenford Christian Church. 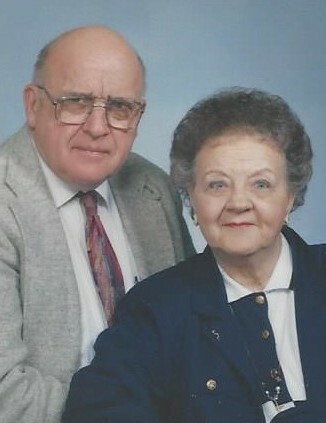 Margaret was married to Russell Lamoncha in 1949. And together they raised 4 wonderful children; Criss Lamoncha, Mark (Sheri) Lamoncha , Maryann (Lamin) Daffeh and the late Karen Lamoncha . Margaret has six dear grand children and four great granddaughters. She was preceded in death by her daughter Karen Lamoncha, daughter-in love Charmaine, and many dear friends. Calling hours will be held 10am-11am Saturday January 26, 2019 at Greenford Christian Church in Greenford OH with celebration of life immediately following at 11am. In lieu of flowers, the family suggests donations may be to a donor’s choice of charities in Margaret’s name.